This item comes with enough connectors and the bending tool to bend and build three (3) 10' wide X 10' long round top hoop houses using 1" emt tubing . These hoop house units are designed to be 10 feet long so they are hand portable, they can be clamped together end to end using plain stainless steel hose clamped from any hardware store to create any length hoop house you want. 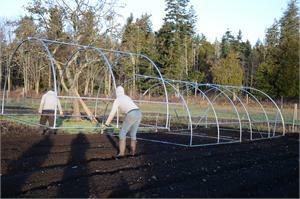 These units require 24 ft wide poly to cover the main top (up and over the hoops) For length just add 2 feet to the length of the greenhouse. Example if building single units you need one 24x12 for the top and one 24x10 split in half for the to ends. If you are connecting all three together for a 30 ft long house you need one 24x32 for the top and one 24x10 split in half for the two ends. Poly is Snap Clamped to frame using clamps every 12 to 16 inches. The advantage of this system is simple and effective. Gardening locations change from year to year as well as garden sizes. Two people (see photo) can bend the hoops and complete the frame in less than one hour. After constructed, each unit is light enough to be easily moved by two people. 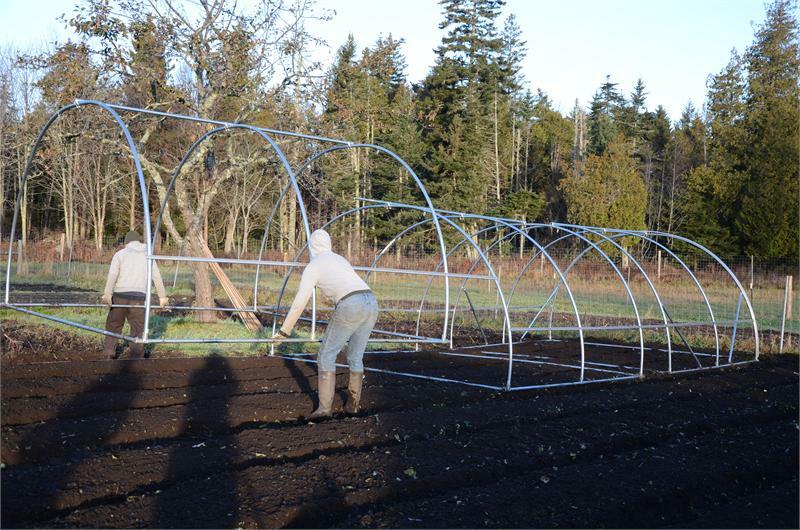 You can place these units end to end creating as long a hoop house as needed for that garden season and able to be quickly re-configured next season as needed.